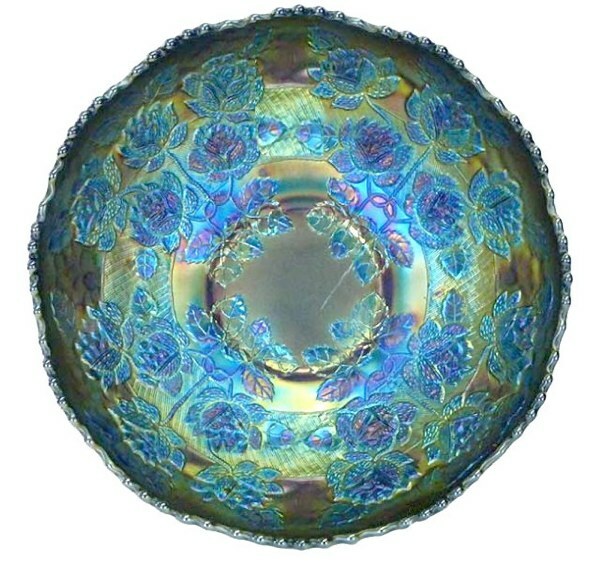 Blue ROSE TREE Bowl - Sold for $33,000. Seeck Auctions - April 2012. 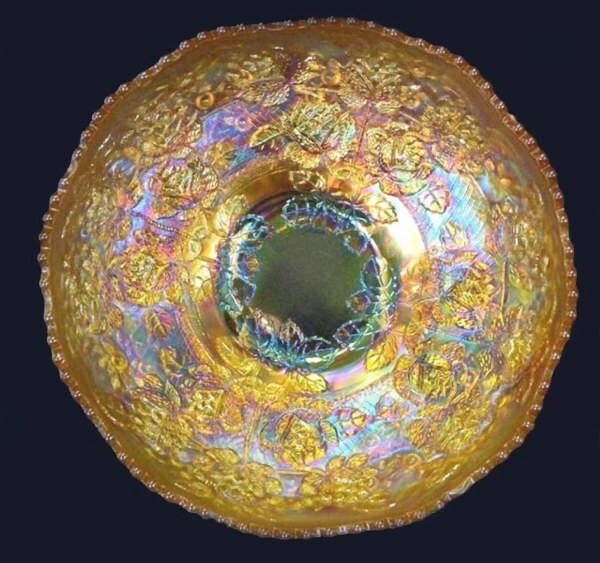 Marigold ROSE TREE Bowl - Sold for $29,000. ORANGE TREE - Exterior mould used for ROSE TREE Bowls. 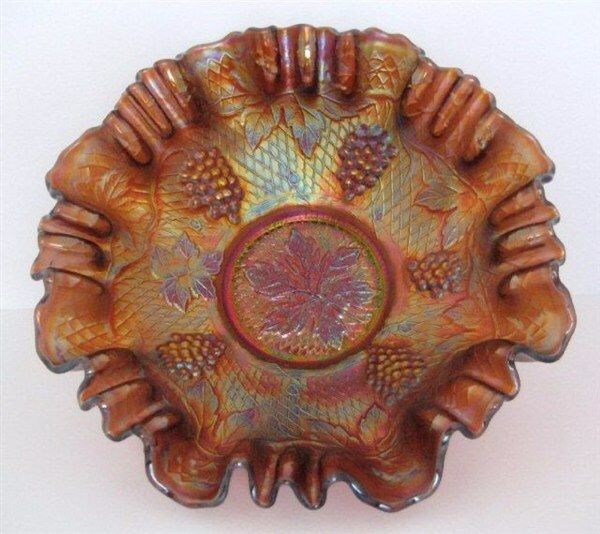 ROSE TREE: Always known to be a very scarce - rare bowl! In times when “collecting” for the sheer unusual qualities and beauty of a piece was the main reason for buying, the first sale on record, of a blue ice cream shape brought $1800. in 1993. Another brought $2800. in 2002. A ruffled blue ice cream shape sold for $3150. in 1996. A marigold example brought $500 in 2005 and another, $1000. in 2009. With recent results of $33,000 for an ice cream shape blue, and $29,000 for a marigold of the same shape, we see more of the trend toward “investment” outlook. 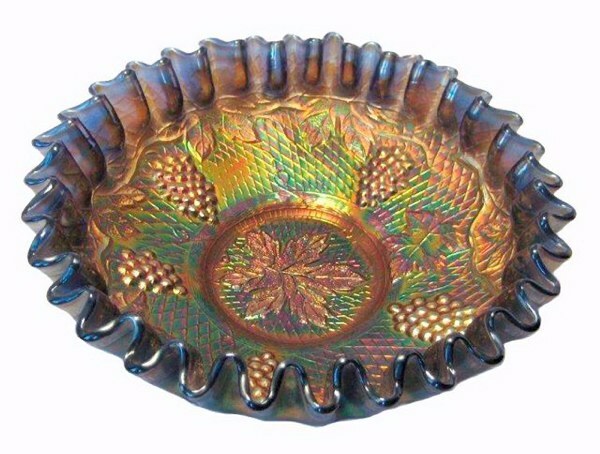 These 9 5/8” bowls create such sensation when one comes up for sale, that little notice is taken of the Orange Tree exterior design. Since so few of these Rose Trees come up for sale, we wonder whether the mold was created late in the era, with only a few in number provided for salesmen’s samples? Based upon the intricacy of the pattern, perhaps an unusually high price was requested and no orders were taken? The pattern does not appear in any of the Butler Brothers Wholesale Catalogs we gleaned from in forming the Reprint issues. CONCORD 3-1 edge 9 inch bowl in Amethyst. Blue CONCORD - Courtesy Debbie & Rick Graham. 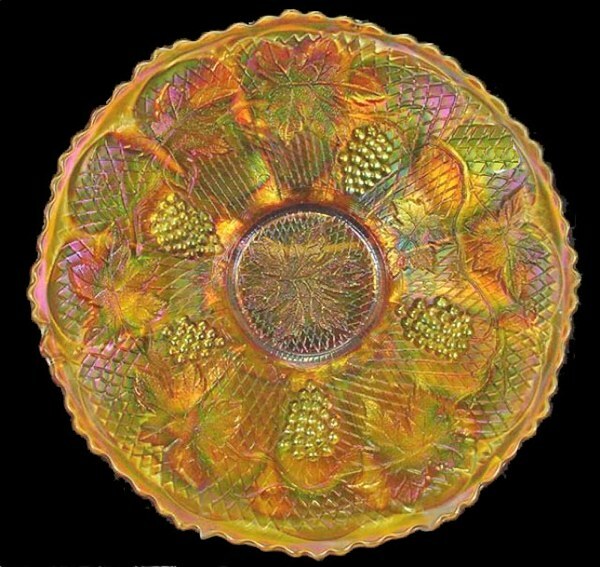 Marigold CONCORD Plate - 9 inch. 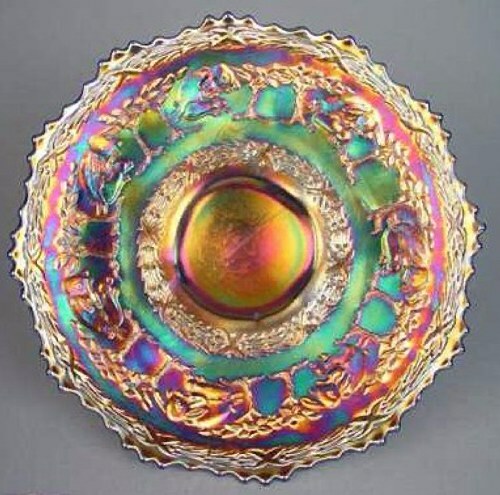 CONCORD: Rick and Debbie Graham are long-time collectors, and are always looking for examples having super color. Certainly these two specimens meet that criteria! The CRE and 3 and 1 edge treatment are favorites for collectors. You may click on -- C -- in our pattern index for viewing some other examples in this pattern. 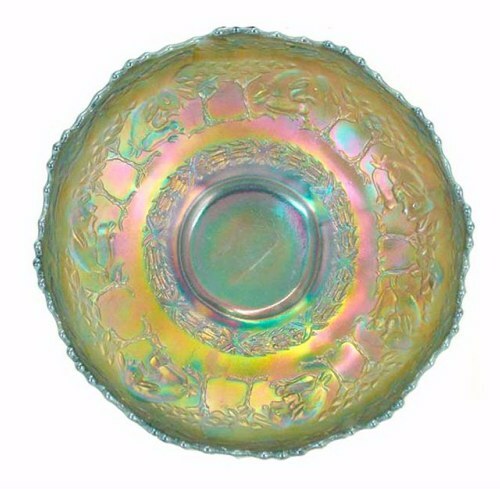 These two bowls in amethyst and blue add nicely to the color spectrum! Marigold as seen on this plate is always a delight! (NOTE) - Detail of KITTENS (FUR). KITTENS Cup & Saucer: While most would say that this pattern is available in ample supply, with basic iridized colors of amethyst, blue, and marigold, we are compelled to say that in our more than 50 years “on the hunt” for yet another shape or pattern in carnival glass, we have finally found the true meaning of “the cat’s meow!” This marigold cup clearly displays the true/intended design at its very best! Just LOOK at the detail in the Kittens’ fur!! 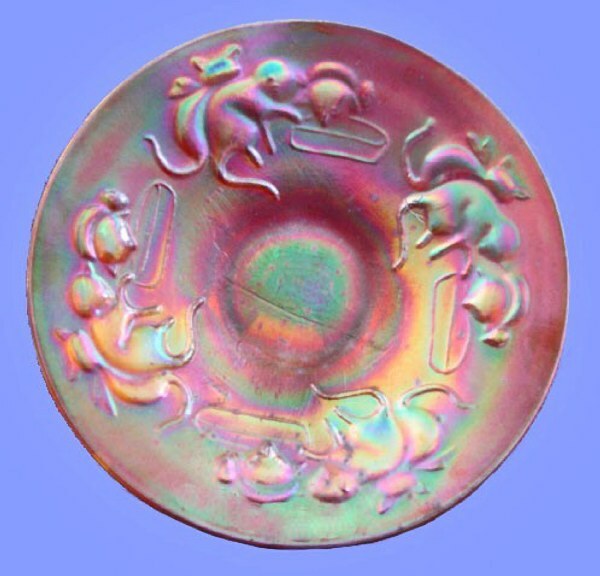 Ruffled and round bowls, banana bowl, toothpick, and a 4 ¼” plate are the known shapes, along with a couple of spittoon extrusions made from blowing a lot of hot air into the center of plate to basically eliminate the kittens design. All the afore-mentioned are derived from the saucer mold. A few saucers have only two groups of kittens, but most have four. Realizing there will be those who do not understand the process of glassmaking, we will attempt to clarify at least partially, the reason virtually all Kittens do not exhibit their “furry-best”. The first run had two groups of kittens, then it was decided to add two more groups to create a better appearance. This accounts for the fact that there are fewer examples found having just two groups of kittens. 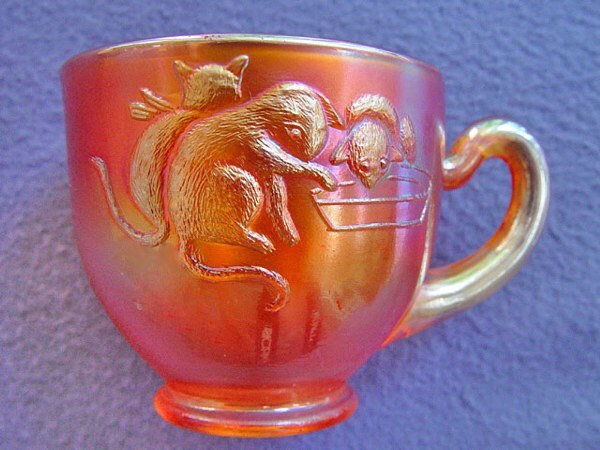 When the cup was made, it went to a single glazer, with a small gas jet on the cup edge to remove the sharpness; then it was sprayed. 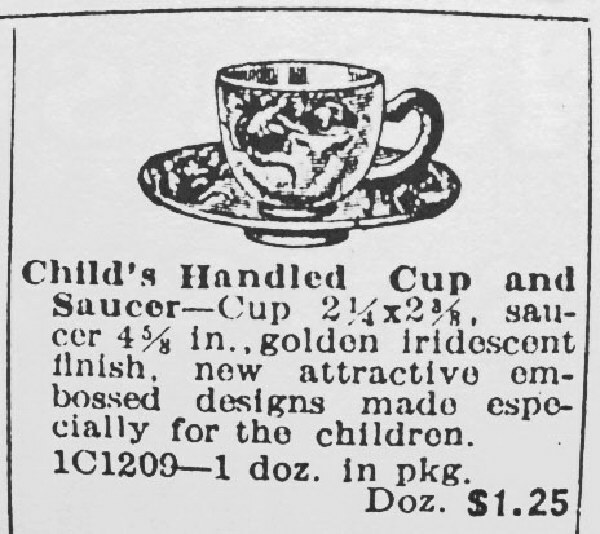 All saucers were formed from the bowl mold. Re-heating took place when expanding to create the flatter surface. Hence, the elimination of fur on the kittens! Note: Click into -- K -- in our pattern alphabet on the homepage for viewing more Kittens shapes. 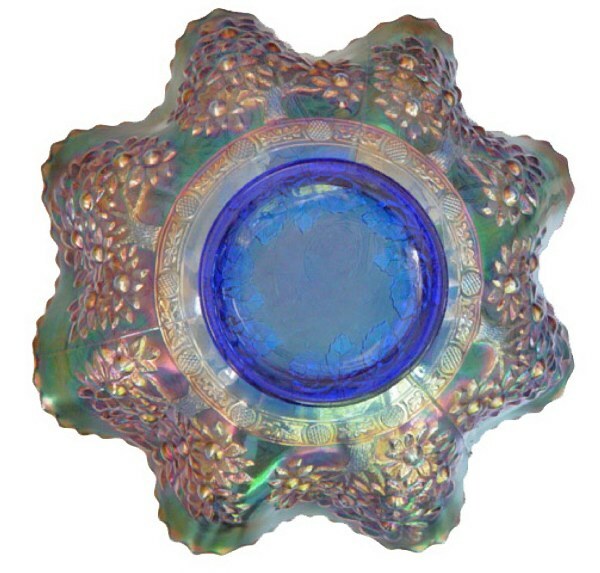 STIPPLED RAYS Compote: Just six months ago, we discovered our first blue example in this shape. Now the green one makes an appearance. Somewhere out there, may yet be a marigold and amethyst compote? We continue to believe that very few of these were produced? 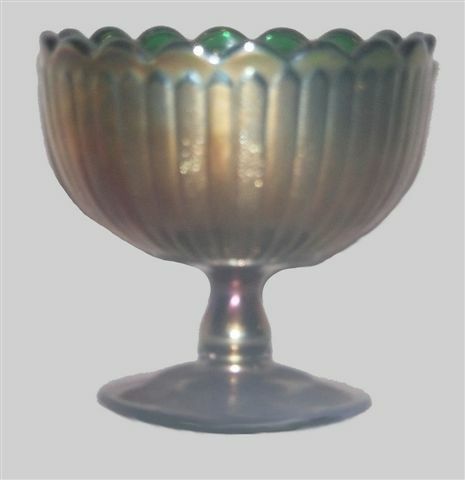 The compote is 4 ¼” high and has a 4 ¼” diameter top opening. NOTE: You may view a blue example by clicking into A TRIBUTE TO THE RINEHARTS. PETER RABBIT - 9 inch Plate in Blue. PETER RABBIT IC Shaped Bowl, 8-9 inch - Green. PETER RABBIT Plate and Bowl: Blue, green and marigold examples offer many of the same design characteristics as those found on Coral and Little Fishes. Possibly more rare than those patterns, these “rabbits” have been found more prevalent in England, leading to speculation that the pattern was introduced to that market. Plates stimulate more buyer interest. However, price results for the ice cream shaped and the ruffled varieties have always been quite adequate! The number of verses and clauses of each verse coincides with its predecessor, as also in many of its words and phrases."